Could Your Attention Difficulties Actually Be from Eye Trouble? Attention-deficit/hyperactivity disorder (ADHD) has long been associated with fidgety children. However, up to eight million adults in the US also have the disorder. Like children with ADHD, adults with the condition typically have trouble concentrating, get distracted easily, have problems following directions and organizing their tasks and forget to do things. As a result, they may perform poorly in their jobs, be chronically late, have difficulty controlling their anger and have relationship problems. Latest development: More and more research as well as years of clinical experience among eye doctors working with children and adults previously diagnosed with ADHD now show that many of these individuals may instead have visual attention problems. For example, people who have difficulty coordinating both eyes at near distances — a condition called convergence insufficiency (CI) — can’t change their focus quickly. As a result, they have difficulty concentrating, tend to read slowly and eventually avoid reading. This often causes them to procrastinate at work and skip from one project to another — behaviors that are commonly associated with ADHD. CI, which affects up to 10% of adults, is the vision problem most commonly misdiagnosed as ADHD. Red flag: When medication prescribed to treat ADHD, such as methylphenidate (Ritalin), atomoxetine (Strattera) or amphetamine and dextroamphetamine (Adderall), doesn’t improve the condition, it can indicate an undiagnosed vision problem. But vision therapy, which has long been used for such common vision problems as lazy eye, crossed eyes, reluctance to read, dizziness or double vision, can help. At your yearly eye exam, your optometrist or ophthalmologist tests your eyesight and eye health. What most people don’t realize is that it’s possible to have 20/20 eyesight — that is, you can accurately read an eye chart — but also have very poor vision, which is the ability to focus on and, therefore, comprehend what you see. Adults with poor vision may be frustrated at work as their reading and comprehension abilities worsen at the end of the day when eyestrain, headaches and other factors exacerbate visual attention problems. Case study: Michael, age 62, is a corporate vice president who believed that his inability to reliably process and retain written material was keeping him from being promoted. His difficulties were so troubling that he feared he might have Alzheimer’s disease. During an eye exam, Michael was found to have 20/20 eyesight with his glasses, but when I asked him to focus on a penlight as I moved it within about 12 inches of his eyes, he developed double vision. This and other tests indicated that Michael had CI, which explained why he had begun to dread reading and had started to avoid it. The solution: To treat his CI, Michael learned through vision therapy to move his eyes in tandem. He accomplished this by performing exercises to gain better physiological control over his ocular muscles, permitting rapid, effortless movement of the eyeballs so they could easily fix on distant and near points. Within three weeks of twice-weekly vision therapy sessions, he increased his reading speed and comprehension. His symptoms were eliminated within two months, and Michael began to read once again for pleasure. DO YOU NEED VISION THERAPY? If you suspect that you may have a vision problem such as that described above, there is a simple self-test you can try at home. 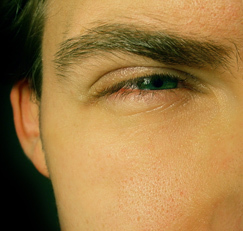 Self-test: While standing (and using your glasses or contacts if necessary), cover your left eye with your left hand. Hold your right hand in front of you at arm’s length and make a thumbs-up sign or hold a pen vertically in your right hand. Move your thumb or pen (looking at the tip) slowly in a random pattern (in and out, in a circle and slowly toward your nose) while following it with your right eye. You should be able to quickly, comfortably and effortlessly follow your thumb or the pen, always seeing it clearly and not as a double image. Repeat on the other side. Then do the same procedure with both eyes open. If you cannot do the exercise as described, you may need vision therapy to improve focus flexibility, reduce eyestrain, prevent dizziness, etc. Consult a vision therapist (typically an optometrist). He/she will perform a routine eye exam, testing for both eyesight and vision problems, such as eye-movement control, peripheral vision and visual perception. To find a practitioner in your area, consult the College of Optometrists in Vision Development, 888-268-3770, www.covd.org, to locate a doctor who is board certified in vision therapy. Even if you aren’t aware of any of the visual symptoms described here, it’s a good idea to ask your eye doctor for this type of testing at your normal checkup or refer you to a practitioner who can. If a vision problem is diagnosed, the next step is to have your doctor tailor a program to your specific needs. Therapeutic tools such as lenses, prisms, eye patches, computer software, balance equipment and biofeedback devices may be used. Our average patient sees significant improvements within a few months of twice weekly, 50- minute sessions that are reinforced by 15-minute exercises done daily at home. Some health insurance plans cover doctor-directed vision therapy.